Recording artist Erykah Badu attends the Soul Train Soul Food Vegan Dinner Party on November 21, 2016 in New York City. *Erykah Badu has been chosen as this year’s honoree at its eighth annual Black Women in Music celebration. The magazine’s invite-only gala will take place Feb. 9 in Los Angeles. The Grammy Week event, presented in collaboration with The Recording Academy, will also salute the nominees for the 59th annual Grammy Awards airing on Feb. 12. Sponsored by Lincoln, the Black Women in Music evening will feature a performance from Roc Nation-managed Nigerian artist Tiwa Savage. 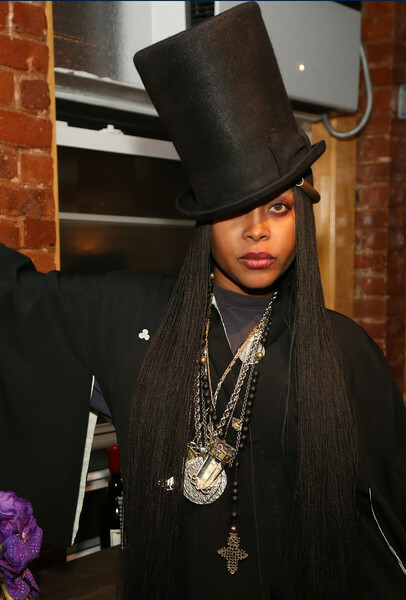 “From the time that she first hit the scene with ‘Baduizm,’ we all fell in love with the genius that is Erykah Badu,” said Essence editor-in-chief Vanessa De Luca in a release announcing the annual celebration. Past Black Women in Music celebrations have honored to Mary J. Blige, Jill Scott, Kelly Rowland, Janelle Monae, Solange, Emeli Sandé, Andra Day and Epic Records president Sylvia Rhone.